A local opera popular in southwestern China, Chuanju opera features vivid, humorous narration, singing, and acrobatic fighting, showing the optimism and open-mindedness of the people in Sichuan Province. 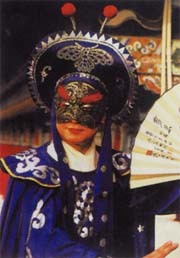 One of the fascinating artistic charm of the opera is the change of the face masks, which is done by tearing off, rubbing away, or blowing off quickly one mask to let another one appear. Tongliang County has long been known for its production of dragon lanterns and the dragon lantern dance. The dance features large stage properties, exaggerated dance movements, and a grand atmosphere. It is performed amidst the blowing and beating of Chinese wind and percussion musical instruments and a display of fireworks to present a scene of jubilation. Chongqing is known for its acrobatics. Balancing on a Plank and Bowls Topping by the Chongqing Acrobatic Troupe won a silver medal at the Ninth World Acrobatics of Tomorrow Festival and the troupe’s Plate Spinning and Jumping Through Hoops were winners of the Silver Lion Medal at the National Acrobatics Tournament.